Bombings in Istanbul: Linked to Syria, Israel… or Russia? 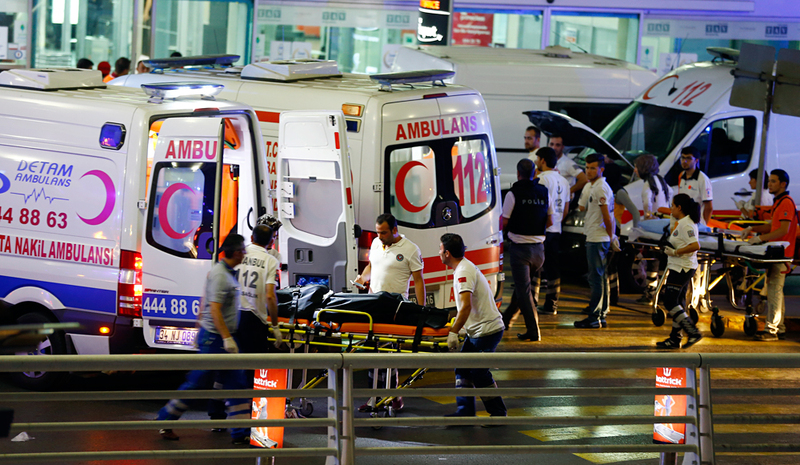 Paramedics push a stretcher at Turkey's largest airport, Istanbul Ataturk, Turkey, following a blast June 28, 2016. The Turkish Prime Minister has been quick to accuse ISIS for the bombings at Istanbul’s Ataturk Airport, while some analysts are blaming Kurdish separatists. One politician in Russia even linked the attacks with the fact that the events took place just two days after Turkey declared it was beginning to normalize relations with Israel and had taken a step toward reconciliation with Russia. Is this really the case? At least 41 people died in Istanbul’s Ataturk Airport on June 28 after three suicide bombers exploded bombs in the airport. More than 230 people, including at least one Russian, were injured. No one has yet claimed responsibility for the terrorist act, however Turkish authorities assume the attack was organized by Islamic State (ISIS). Turkish Prime Minister Binali Ildirim stated that all evidence points to ISIS. There are also theories that the terrorist act could have been orchestrated by the Kurdistan Workers' Party (a Kurdish separatist group that Turkey, the U.S. and the European Union recognize as a terrorist organization). Konstantin Kosachev, head of the Russian Federation Council Committee on International Affairs, has written on his Facebook page that the terrorist attack in Istanbul is a response to Ankara's attempts to re-establish relations with Moscow. However, Russian and Turkish analysts see no clear link between the bombings and attempts to re-establish links between the two countries. They say it is more related to the Syrian crisis and the improvement of ties between Turkey and Israel. Yury Mavashev, Middle East and Turkey scholar and expert at the Caucasus Geopolitical Club said it was too soon to link the event with the normalization of Russian-Turkish relations. "It's obvious that the terrorist act, in which at least one Russian person died, is not a provocation to compromise bilateral relations," said Mavashev. Kerim Khas, Eurasian politics expert at the International Organization of Strategic Studies independent analytical centre (USAK) in Ankara, agrees with Mavashev. "I don't see a direct connection between the terrorist act in Istanbul and the measures that Ankara has taken to normalize relations with Russia,” he said. “The attack is related to the fact that ISIS is experiencing serious losses in Syria as a result of the operation carried out by the coalition forces. The radicals just want to frighten Turkey." Analysts see a possible link between the tragedy and Ankara's intention to re-establish relations with Tel Aviv. The top topic in the Turkish mass media on June 27 was normalization of ties between Turkey and Israel after a six-year crisis. There was an incident in May 2010 involving the Turkish Freedom Flotilla, which was bringing humanitarian aid to the blockaded Gaza Strip. When the vessel tried breaking the blockade, Israeli border guards opened fire, killing eight Turkish citizens. Relations between the two countries deteriorated drastically after the incident, and were maintained by low-ranking officials. The terrorist attack in Istanbul has given rise to theories that it is linked to the Israeli issue. "This probability should not be excluded," said Mavashev. "Turkey's rapprochement with Israel could have spurred the terrorists to commit the crime in the international airport in Istanbul, given Turkey's former position in relation to those who are fighting Israel, regardless of the methods. The terrorists could have once again reminded Turkey of their existence."